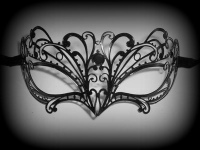 Radiate timeless sparkle with this stunning silver filigree mask that will perfectly express your elegant sense of style. 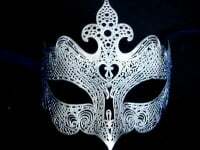 Timeless and elegant this stunning Occhialino Lux Filigree Mask - Silver Edition by Simply Masquerade displays classic sparkle that will never go out of style and will complement any of your looks at any party or ball you attend. Ensure you dazzle with style and elegance for your special occasions with this undeniably beautiful Filigree metal lace mask with shimmering Swarovski Crystals. 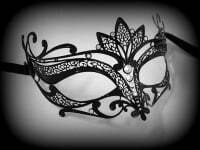 Satin black ties complete the overall look and the mask can be worn by a man or lady. Due to its nature each design is totally unique and makes the piece extra special.